An Ebola outbreak in Guinea has left it battling to contain confirmed cases and halt the spread of one of the world’s most lethal infectious diseases. Its West African neighbours are also concerned. 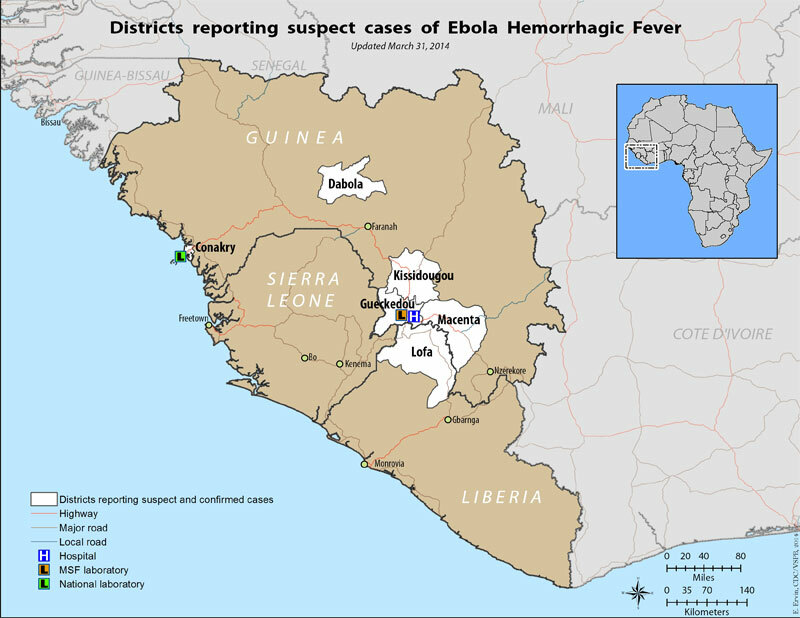 Guinean health authorities have reported 143 suspected cases and 86 deaths. The World Health Organisation (WHO) has confirmed seven suspected and confirmed cases in Liberia, including four deaths. Sierra Leone is readying itself by stepping up surveillance and calming the public. The epidemic has prompted a large-scale medical response and although no international travel restrictions have yet been placed on the region, neighbouring country Senegal has closed its border with Guinea. WHO has dispatched protective equipment to medical personnel in the region and is working closely with local authorities and Médecins sans Frontières (MSF) to co-ordinate a response to the outbreak. The Guinean president, Alpha Conde, is appealing for calm as public information announcements reassure the population and advise them on how to avoid contact with the virus. Presently ChildFund operates in all three affected countries and we are watching closely for developments. The National Offices have been provided with adequate information on the virus and they have all established contact with their respective Ministries of Health (MoH), WHO and other NGO’s providing services and monitoring the situation. We hope that ChildFund’s work will not be impacted in the region but attentiveness is called for. Past experience has shown that containing the spread of the virus is the best defence against it. ChildFund’s work includes health and sanitation projects in these three West African Nations. In Guinea, ChildFund’s Local Partners mounted awareness raising campaigns in collaboration with the Ministry of Health, WHO and MSF to enable people to identify themselves if they have been in contact with affected people. As at today 50 people in the Dabola area have identified themselves as having made contact with affected people either due to visiting a sick relative or attendance at funerals of those who have passed away. The district hospital in collaboration with MSF and WHO have setup isolation centers and ChildFund is working with the medical teams to get people to report to the isolation centers. ChildFund is also working on a proposal to intensify their sensitization campaigns which is presently been done through the use of cell phones. The awareness raining campaign will be done through the school children and teachers in their respective homes and villages. The intervention will also make provision for the supply of sanitation kits for schools targeting children and teachers and staff working with the federations and in area offices, as well as provision of food for those in isolated villages and sanitation kits through UNICEF. In Sierra Leone, ChildFund is working in close collaboration with the Ministry of Health, other line ministries and NGO’s to be able to contain the situation. If it becomes necessary, ChildFund will try and establish a joint operation with other organizations that have operations in the same locations. In Liberia, ChildFund has been in contact with the Ministry of Health to have detail information of the situation in the country and how they can work together to support the Governments and NGO’s efforts. There is no specific treatment or vaccine for the Ebola virus, a haemorrhagic fever which causes vomiting, diarrhoea and external bleeding. It was discovered in 1976 and first appeared in Guinea in 1994.It is believed to be transmitted by bats and has a fatality rate of up to 90%. Ebola can be transmitted to humans from wild animals, and between humans through direct contact including unprotected touching of the bodies of the dead. As health officials are fighting to contain the outbreak, we await further news.